We are very confident that Helikites are far better than other comparably sized aerostat designs. 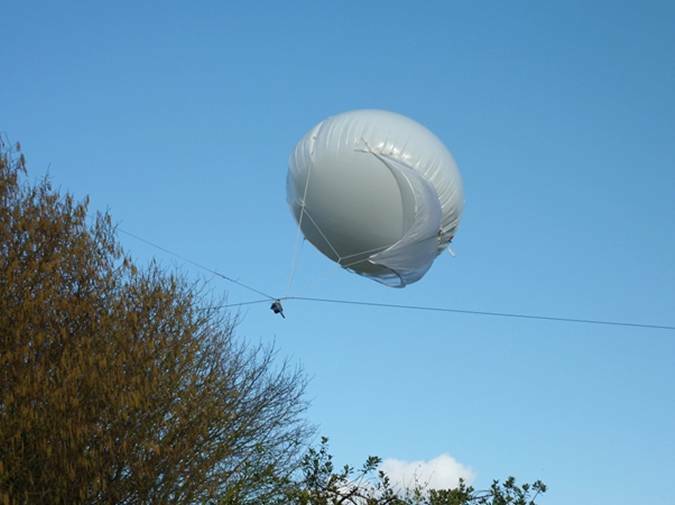 However, customers may find other aerostat manufacturers claiming their aerostats are good too. 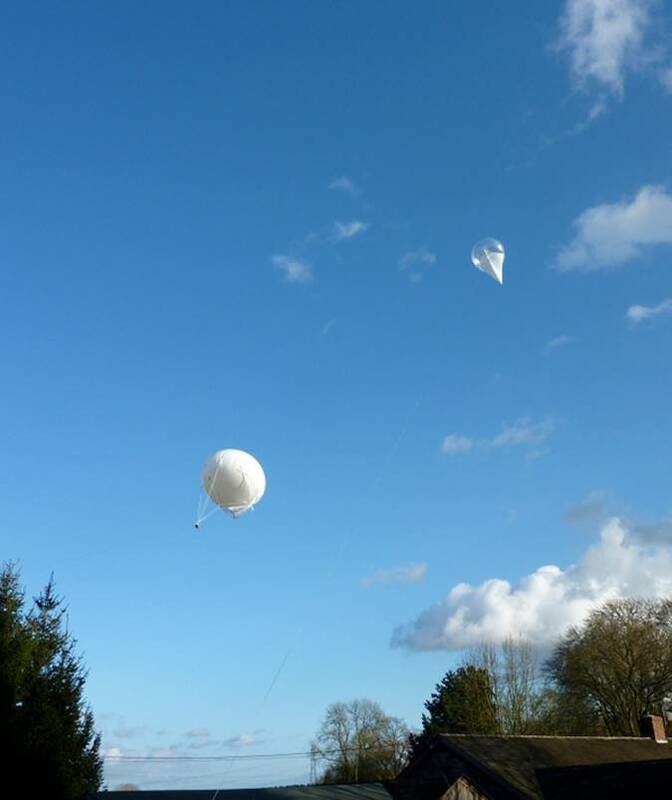 We doubt their claims, as experience tells us that other designs of small aerostats often do not fly very well in adverse weather. 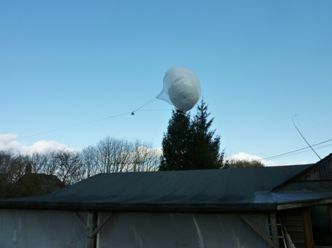 Some aerostat operators and government agencies spend tens of thousands of dollars on inferior net-curtain balloons or small blimps that were only test flown in calm weather before purchase. Later they often find that in winds, dust-storms, rain or with added payload, their so-called aerostats are not flying properly, but instead they are crashing around all over the place. The problem is that as Helikites are also small, rounded aerostats we may be tarred with the same brush and so customers may tend to think Helikites will behave the same way. What is to be done about this problem? Simple. If you wish, we can provide you one of each type of aerostat design of the same size for fair comparison. You can fly them in any weather you like to see for yourself. If you wish to return the other blimps, (which, after flying them we think you will) then we will refund you the money. Helikite flight is stable, high altitude, all-weather and reliable. Helikites have excellent pure helium lift, and solid payload attachment points for cameras, radios and sensors. Helikites are far smaller than most aerostats for better performance and are both simple and safe to use. Helikites cope with extremes of temperature, wind, precipitation and maritime weather conditions better than any other aerostat in the world. Helikites fulfil peoples' expectations of lighter-than-air aerostats. This is why thousands are sold worldwide for a very wide variety of tasks, many of which were not possible before the advent of Helikites. To avoid repeating ourselves, please see here for a full explanation of the aerodynamics of Helikite flight. Spurious claims are sometimes made about Net Curtain Balloons (NCB’s) from certain suppliers, including ludicrously unrealistic wind speed capabilities (such as the ability to fly in hurricanes), absurd aerodynamic lift claims, incorrect line angle data and incorrect stability data. In our tests, it was found that sometimes NCB’s fly OK for a while, especially if they are not carrying payload, but sooner or later a gust of wind comes along and then they go right down to the ground, with little self-righting capability. With payload attached NCB’s could be horrendously unstable, especially in gusty or unstable winds, such as found near buildings, trees or ships superstructures. The fact is that in every comparative test we know of, Helikites have easily outperformed NCB’s in high wind capability, line-angle in wind, lift in wind, flight stability and payload stability. The only parameter in which NCB’s score well is their pure, net helium lift, in nil wind. This is because the net-curtain stuck onto the balloon weighs very little. Discontented buyers of NCB’s regularly contact us in order to buy Helikites to replace their unsatisfactory purchase, but nobody changes the other direction, from Helikites to NCB’s. Helikites are significantly different to NCB’s because Helikites have a rigid frame, proper kite surfaces and correct design, giving greater stability, altitude and wind-keeping ability. Some NCB’s are entirely spherical in shape, so they have no aerodynamic shape and so no aerodynamic lift. They rely on pure helium lift to combat the wind. The net-curtain simply stops the balloon from rotating in wind, in order to facilitate photography. This is useful compared to a simple spherical balloon, but the line-angle performance in wind is poor and simply directly related to the excess helium lift. Other NCB’s claim aerodynamic lift due to the balloon being oblate-spheroid in shape. There may some occasional, unstable, aerodynamic lift, but most of the lift is actually coming from the excess helium lift - and with it the excessive size. 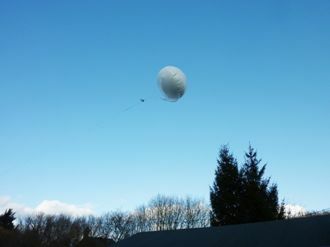 The test for aerodynamic efficiency is the line angle achieved when the aerostat or balloon is weighed down until it is exactly neutral in weight in air. In these circumstances, all the lift must be due to aerodynamic forces and not helium. This is very instructive. In our tests we have found that simple balloons, blimp aerostats and spherical NCB’s show no lift at all, and just bounce on the ground until punctured. 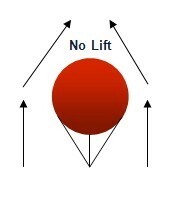 Oblate-spheroid net-curtain balloons, that are correctly adjusted (not easy), show lift with a line angle of 30 degrees from the ground, which gives 33% of possible altitude. In comparison, Helikites show 45 degrees of line angle from the ground – which gives 66% of the possible altitude. This is a logical result given the shapes of the respective aerostats. This line angle matters a lot. NCB’s are far more likely to have their flying line catch in rooftops, aerials, trees, etc as they need twice as much flying line to reach the same height as a Helikite in a strong wind. Mountains tend to have slopes at 45 degrees angle. Experiences of our customers has shown that NCB’s crash into the sides of mountains, whereas Helikites fly over them. Good pure helium lift in no wind compared to blimp-shaped aerostats. Balloon does not constantly spin compared to simple balloons. Oblate-spheroid shape copes with pressure changes quite well. May exhibit some aerodynamic lift if correctly adjusted. Easy to make and so cheap to buy. Low aerodynamic lift, if any. Unstable in wind compared to Helikites. Lower wind speed capability compared to Helikites. Extremely difficult to adjust the numerous bridle lines, as the slightest differences in length creates great instability. No stable place to attach payloads - especially cameras that just dangle from the wobbly bridle lines. Constant yawing in wind which makes pointing cameras or antennas very difficult. Bridle lines require different adjustment for different wind speeds which is usually impractical and often unsafe. Bridle lines become tangled in storage. Net-curtain liable to be ripped off in high winds. Constantly changing attitude makes it very hard to keep high-gain antennas in the vertical position. The net-curtain and the angled balloon interfere with camera line-of-sight. Payload often causes net-curtain balloons to become extremely unstable because there are no payload damping mechanisms. Only very expensive gyro-stabilised video cameras function for surveillance, due to the payload instability. Little self-correction when instability occurs. They keep on going down until they hit the ground. Cannot easily hold antennas vertical in changing wind conditions, due to the body of the balloon changing angle as the wind speed increases. Kingfisher net-curtain balloon plus small payload is unable to fly in 30 mph winds & crashes repeatedly onto a shed damaging the roof. When more flying line is let out, the Kingfisher does not fly higher, instead it goes under the telephone wire and becomes entangled. It proved hazardous to fly these balloons in strong winds. A Skyhook Helikite half the size of the Kingfisher net-curtain balloon, flies steadily, way above the wildly moving Kingfisher. 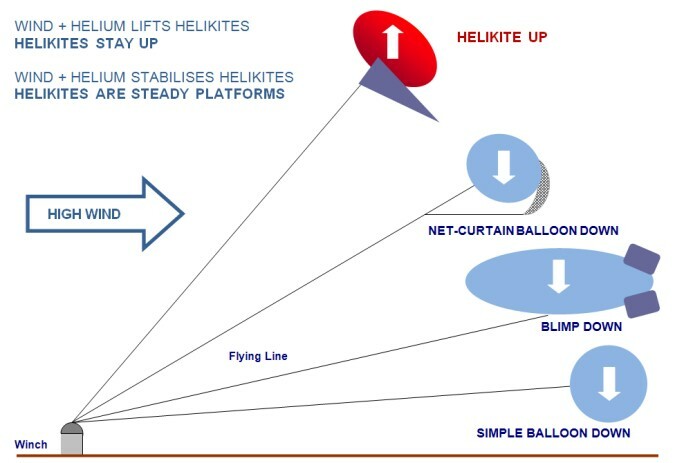 Helikites cope with high winds far better than net-curtain balloons. Keel for stabilisation of the balloon and payload. 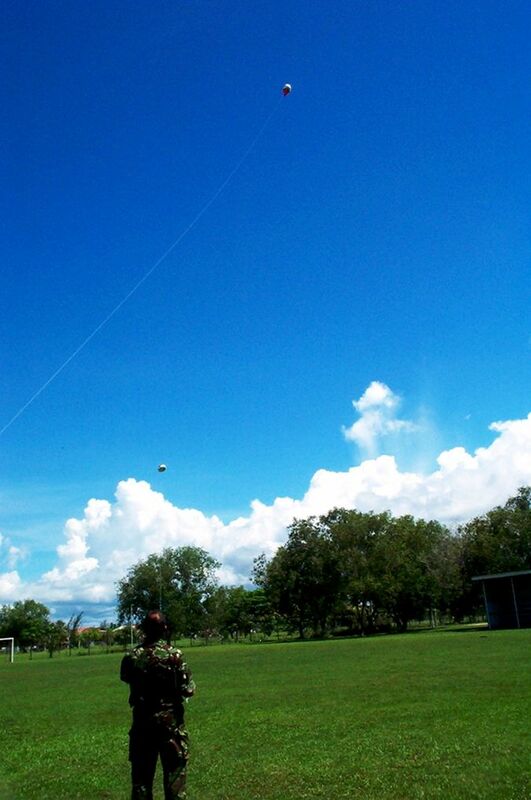 Kite sail to provide greater aerodynamic lift. Stiff spar to provide structure and reliable gravity stability. Solid and stable, carbon-fibre Payload Attachment System. In other words they suffer from a lack of being a Helikite. It was the shortcomings of standard small blimps that originally led to the creation of the Helikite. Our views on this basic sausage-shaped blimp design are based on our many trials in all types of weather and other industry information. Frontal View of conventional Zeppelin style tethered blimp. The blimp balloon is very narrow, so the wind passes from the underneath the blimp and over the top of it with little or no aerodynamic uplift. Only, the fins at the back can create lift - and this causes problems. The long thin shape of CTB’s means that they have a too much heavy skin for every cubic meter of gas. So they have relatively little net helium lift. High winds on the rear fins cause the stern to rise. With only limited helium lift at the nose, the bow then drops causing “porpoising”, making small conventionally shaped blimps unstable. Huge CTB aerostats of around 400 m3 or more, can fly in high winds if they are well designed and well maintained. This is because they utilise massive amounts of helium lift in the nose to counteract the de-stabilising effect of the wind. However, compact CTB’s do not have access to this huge amount of helium lift in the nose (because they are attempting to be small for ease of handling and cost) - but the wind is just as strong for them as it is for the massive blimps. So the classic blimp shape does not scale down as might be expected from just looking at the shape, which is why compact CTB’s do not perform well in wind. A well designed, massive, classic blimp is a good flying machine, when up. The problem is the immense cost, large helium requirement, high manpower and extensive space required. Also, they are very difficult to inflate, deploy and retrieve in high winds. Generally, a Helikite of about one third of the size will do the same job far better. Wind tends to blow CTB’s down, with the result that much of the net helium uplift that they have left, after lifting up their large envelope, is wasted in trying (often unsuccessfully) to combat the wind. These two factors result in such blimps needing huge amounts of helium. This makes them very large, difficult to handle, hard to winch in, susceptible to rainfall, expensive, low performing and normally just too much trouble to be worthwhile using at all. This is why very few large CTB’s are ever used by commercial companies, who have to account for the real cost involved. As opposed to the military who just pass it onto the poor taxpayer who has no idea how much extra they are paying for airborne capability compared to Helikites. As an example, to lift radio-relays, the Australian Defence Force replaced their TCOM 17metre long, 800m3 volume aerostats costing US$1.5 million each, with 4 metre long, 15m3 Desert Star Helikites costing just $10,000 each. And the Helikites are doing a far better job too! As wind speed increases, conventional blimps experience erratic lift from their stabilising fins at the back end. However as the nose only has the same weak helium lift, the nose drops, causing the blimp to plunge downwards. 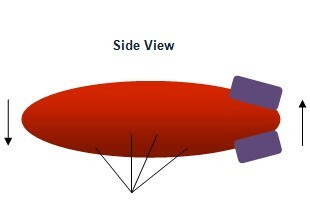 The wind causes more and more problems for conventional blimps the higher they go, because the wind drag on the line increases, but the obviously the helium lift does not increase to match the extra drag. This causes great problems with tether sag, especially in windy conditions. At height, the density of air becomes less, meaning that helium lifts less too, compounding the problem. The conventional blimp’s long thin shape needs good gas pressure to keep it straight and flying true - but if the pressure is too high it will split at the side. So the pressure needs to be kept very close to the optimum at all times. However at height, the atmospheric pressure lowers, causing a relative increase in pressure within blimps, and visa-versa upon descending. Also, high temperatures increase pressure, low temperatures decrease pressure, rain causes evaporative cooling, wind gives wind chill, sun creates great heat and pressure within the envelope and night is colder than day. With normal blimps these factors need to be dealt with by a huge volume of helium to keep the nose of the blimp up, and a complicated, motor powered, expensive, and heavy ballonet pressure control device. However well the pressure is controlled, the nose of long conventional blimp shapes is naturally too soft to withstand the push of high winds. If the nose is distorted in shape the blimp does not fly properly, weaves about and loses height. So conventional blimps need hard reinforced nose cones that weigh a lot, are costly to make and make storage more difficult when deflated. Also, low pressure at the thin tail end causes the fins to wobble creating instability. All these problems add up in a compound way. When an internationally renowned blimp manufacturer was recently asked to quote for the task of lifting 25 Kg to 2000ft in winds up to 50 mph with a conventional blimp it was calculated that it would need to be 400 cubic metres in volume and cost approximately one million US dollars. Also, huge winches would be needed, a large area for the operation and many personnel. In other words, a huge “footprint”. To store and transport the 400 m3 of helium, would require tons of pressurised helium cylinders delivered at vast cost to the site. Also, the winch would need to be huge, and possibly concreted to the ground, otherwise the drag on the blimp in high winds will pull the winch along the ground. The flying line would need to be massive to withstand the pull and the operating area would need to be large to accommodate the huge blimp when it was on the ground. Inflating it and deflating it would take many hours and need numerous people. In comparison, a Desert Star Helikite of only 74 cubic metres, plus a small, easily handled winch, would be needed to lift the same 25Kg to the same 2000ft, in the same weather conditions at about one twentieth of the cost. Compared to Conventional Tethered Blimps of similar sizes, the vastly greater performance of Helikites becomes obvious. In conclusion, a Conventional Tethered Blimp cannot fulfil most peoples’ lifting requirements along with the requisite economy, mobility, speed of operation and minimal personnel. This explains why they are not popular in comparison to Helikites. Small, simple balloons work well if there is no wind. They have the most pure helium lift of any aerostat design. However, in wind they need to be huge to fly properly, also they have a tendency to rotate which is a significant problem for most lifting purposes. As an example, even in places where it would be expected that simple balloons would fare well, such as under sheltered jungle canopy, simple balloons in fact did not do as well as Helikites. This is because thermals moving downwards and sideways push simple balloons down. Only upwards moving thermals push simple balloons upwards out of the canopy. Whereas, both upwards and sideways thermals push Helikites upwards, so despite being heavier, Helikites prove to be far better at moving upwards through the still air of the jungle canopy. Obviously, once in the wind above a jungle canopy the Helikite flies beautifully to great altitude, whereas a simple balloon soon gets blown into the trees and hopelessly entangled in the branches. In conclusion, small, simple balloons cannot be relied on to fly well in windy conditions. Which effectively means they are disappointing most of the time.